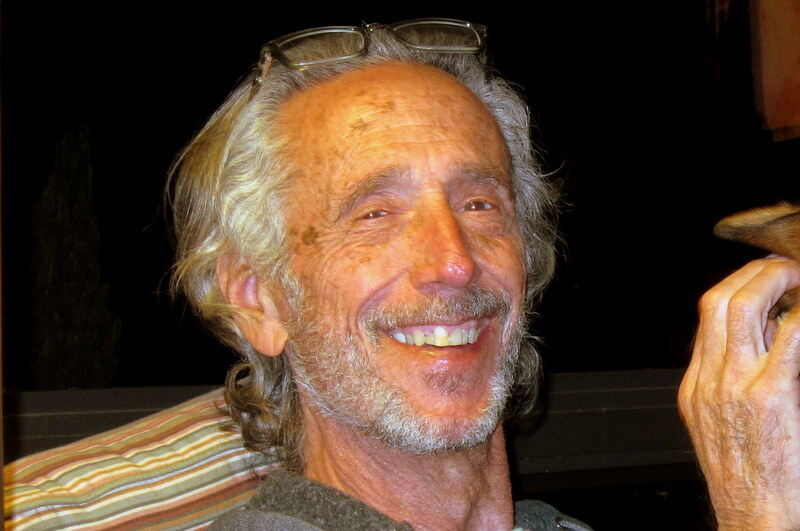 Friday, February 3, 2012 to Sunday, February 12, 2012-Tucson, Arizona: Great time in Tucson…..as always! To begin with it’s always nice to visit family on these trips and in addition we have kinda adopted Arizona as our winter home. My mom lives in a nice assisted living facility very near other members of the family. Mom, at 87 years old is doing as well as can be expected. I made it a point to see her every single day we were in town…..some days for a few minutes and others for an hour or so. 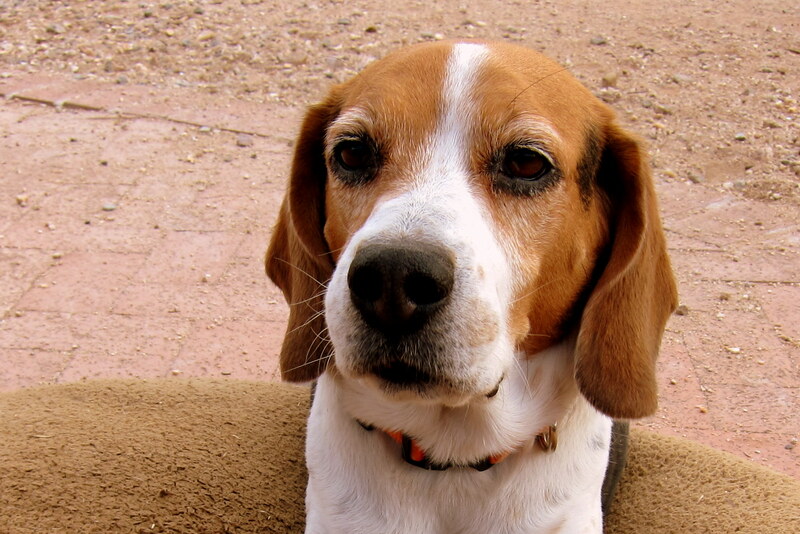 Other family members who reside in Tucson are my bruzzin Dewey. Who share a fantastic home on a large lot and graciously allowed us to once again “Dooryard Surf” on their property……a place I now call The Doobie (Dew-Bea…..get it?) RV Resort. This year they even put in a veranda for our enjoyment complete with lounge chairs and cocktail waitress serving sombrero drinks. 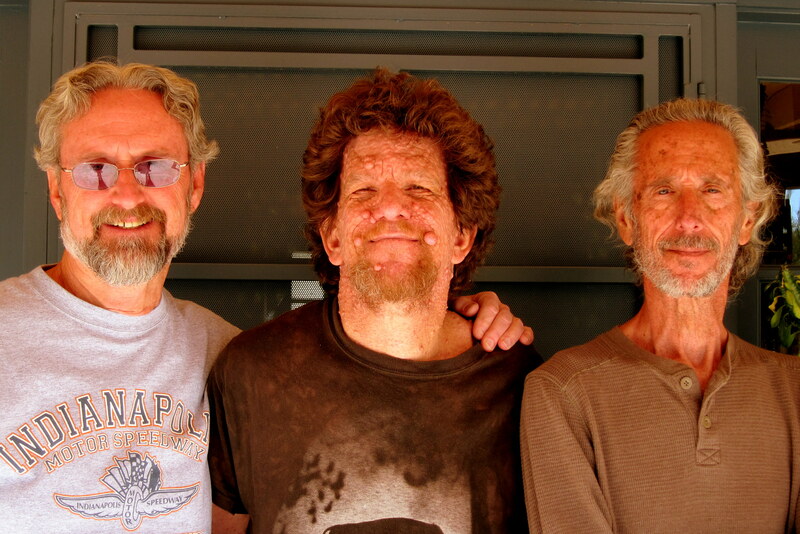 Also, brother Dan lives in town and came over often to visit…..together we make up Los Tres Chiflados. And the newest associate, Kali. Kit and I were pampered by these three and felt quite honored that they allowed us to share their favorite snoozing furniture. All this cuddling only required a scratch behind the ear…..um, the pups, not Kit…..she usually expects at least a nice meal out. OK…..now that everyone has been introduced, what did we do for ten days? Well we ate very well and experienced a lot of interesting things. First the food…..of course. Usually Kit and Bea would whip up something great in the kitchen but we also went out to eat quite a lot. It really pays to know someone that lives in an area as we were able to experience some of Tucson’s best diners. One such place was Ole Restaurant, an authentic Mexican place serving incredible food. 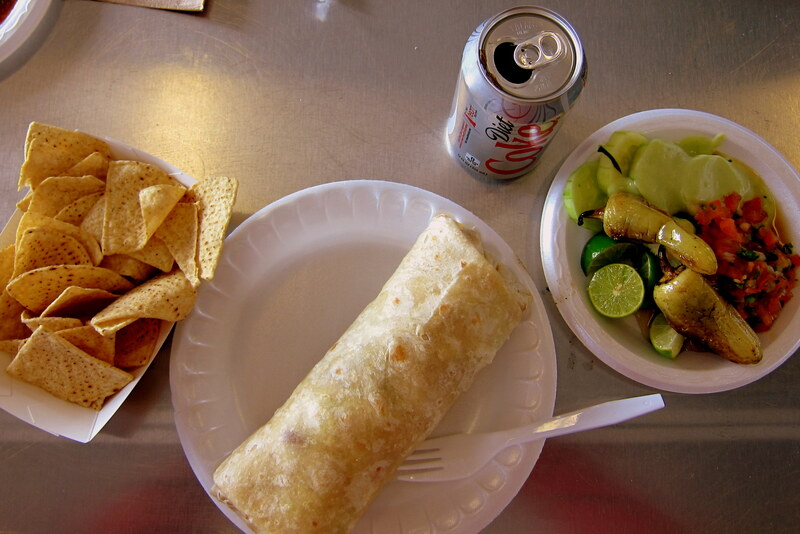 And then there was El Guero Canelo…..a long time favorite of mine and a must stop on each visit. This place started out as a street cart and has quickly grown into a small chain of fast food restaurants. The excellent Sonoran food is plentiful and the prices are reasonable. The bowl on the right is just a small sampling from their condiment table and the carne asada packed burrito on the plate is considered a medium. 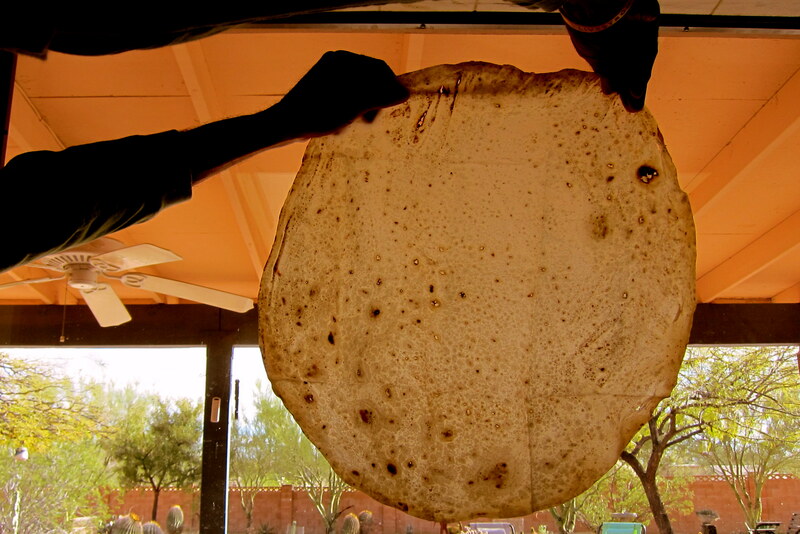 The large one spills over the plate and is known as a burro! 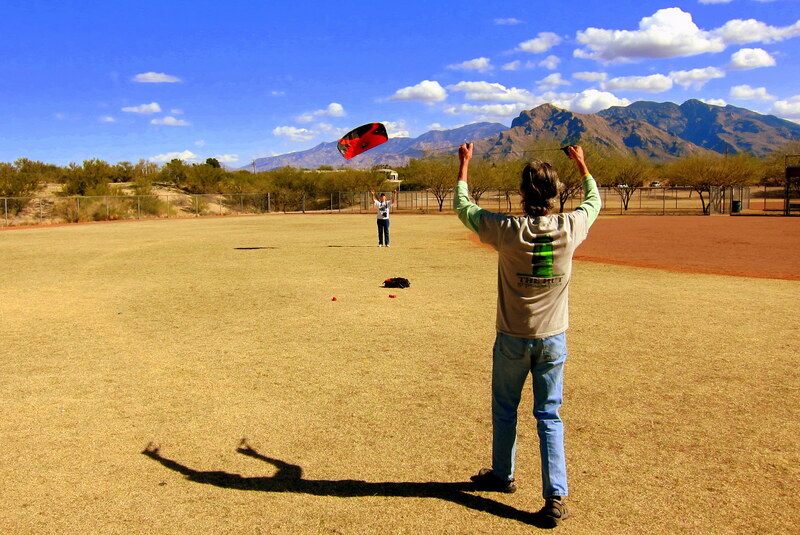 Since we ate so well we had to get outside and do something active…..so off to the park where I introduced Dewey and Bea to the joy of kite flying. They both quickly learned how to control the kite and really had a blast. That evening an Amazon order was placed for a similar style kite but a bit larger. Um, gee…..wonder if I have enough Amazon Reward Points for another kite myself? After all I only have four which hardly seems like enough. Dewey’s fine looking 55 Chevy was running strong so we used every opportunity to use the old girl while poking around town. A real “sleeper” the car looks stock from the outside. 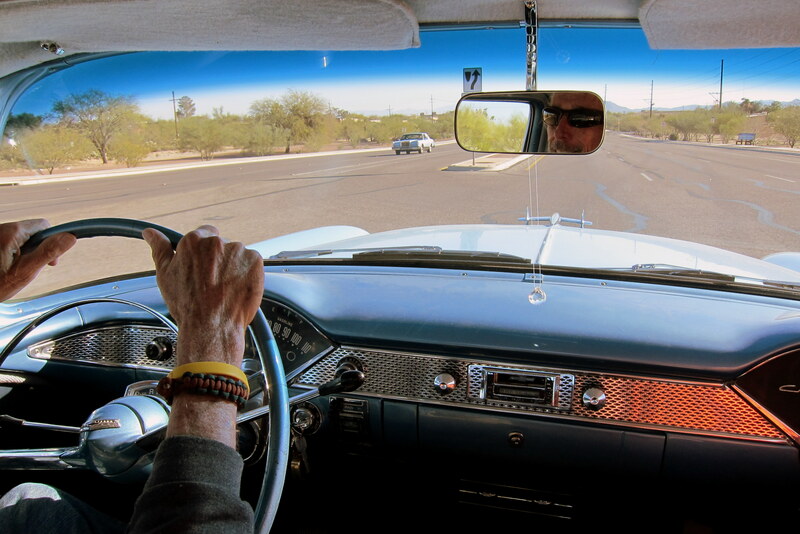 However, there is a 350 CID V8 “crate motor” under the hood along with modern suspension and running gear…..it even features power steering, power disc brakes and modern air conditioning. The 55 runs as strong as she looks and is a blast to tool around in, getting plenty of attention and many thumbs up. The proud and happy owner likes to tell folks that this very car, back when it was bone stock, has family legacy. Dewey’s father originally bought two of these cars and used them for years before passing this one off to his son Dan who later passed it on to Dewey. It was he that restored the car to the incredible condition you see today. It’s common to sport a perpetual grin when driving or riding around in this car. We would actually make up places to go just to enjoy the experience. 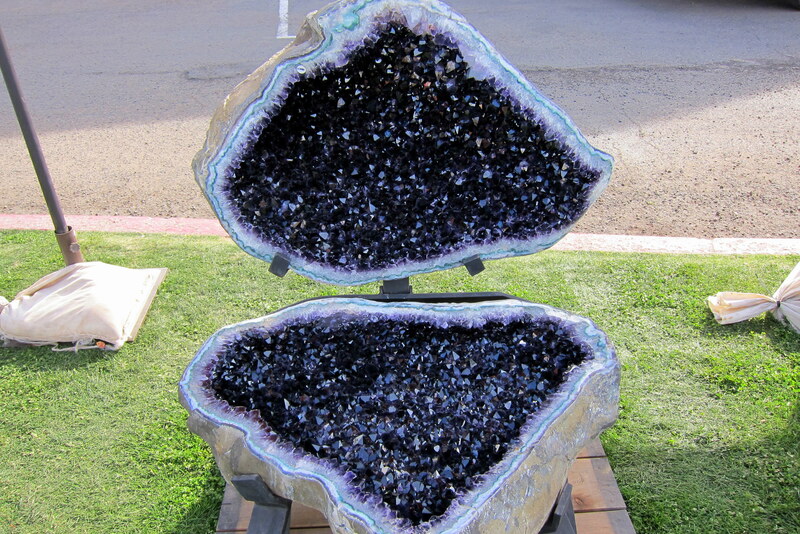 While in Tucson this year we were able to enjoy the Annual Gem and Mineral show…..one of the premier shows of its kind in the world. This two week event attracts thousands and fills every available space in the city with an amazing collection of……well, anything that came out of the ground. There were, or course gems and minerals. 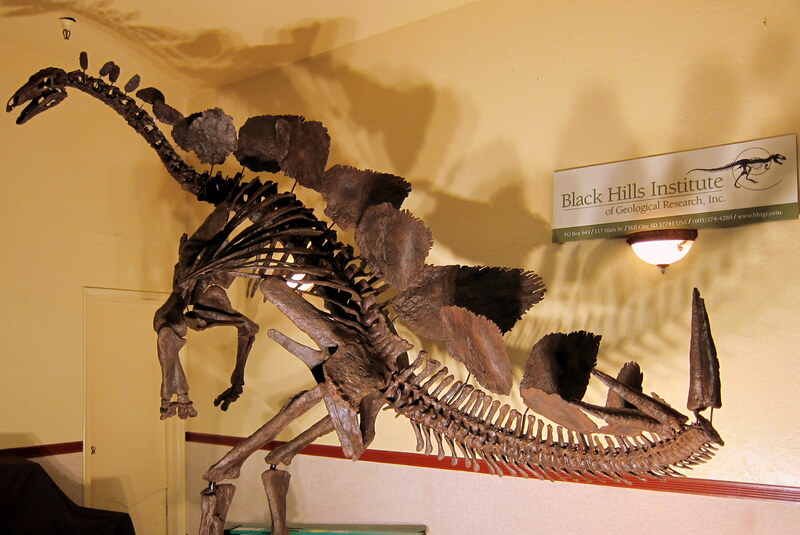 And even complete dinosaur skeletons. In addition, there was lots of hand crafted jewelry. Kit found a pretty ring mounting a very nice PBR. Not sure what kinda stone that is so I’ve been calling it a Pretty Blue Rock…..PBR! Also that happens to be the name of one of the finest brews in the cheap beer aisle. There were specimens at the show that topped $100,000.00 in value and folks traveled from all over the world to buy, trade and sell. Word has it that many museums send representatives to this show in attempt to fill gaps in their collections. We actually spent part of two different days at the show in order to get a real feel for this major annual event. Bea’s sister Jo and her partner Wiley were in town for the show as well. 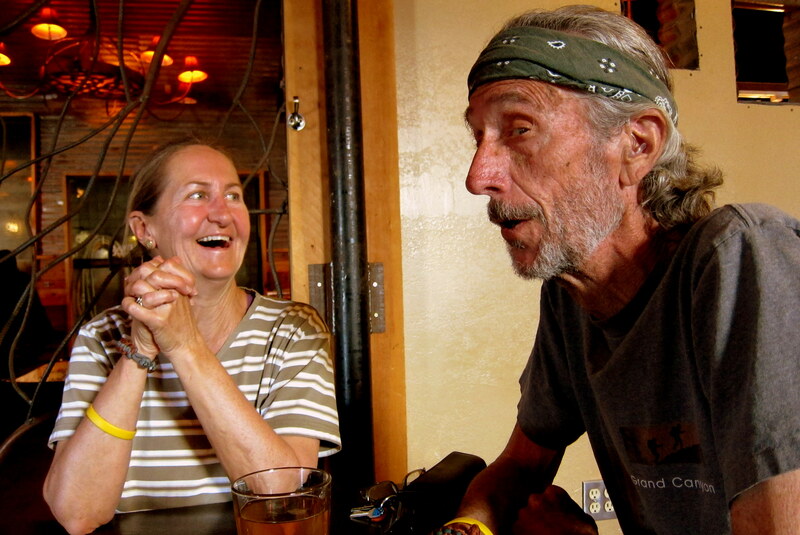 They live in Montana but like most sane retired northerners they spend the winter in the southwest. 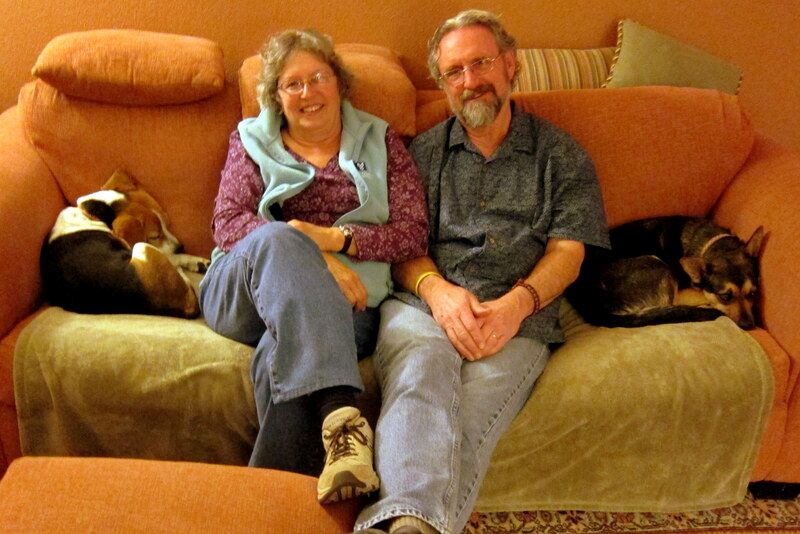 Jo is a former nun and retired college professor and Wiley is a geologist. 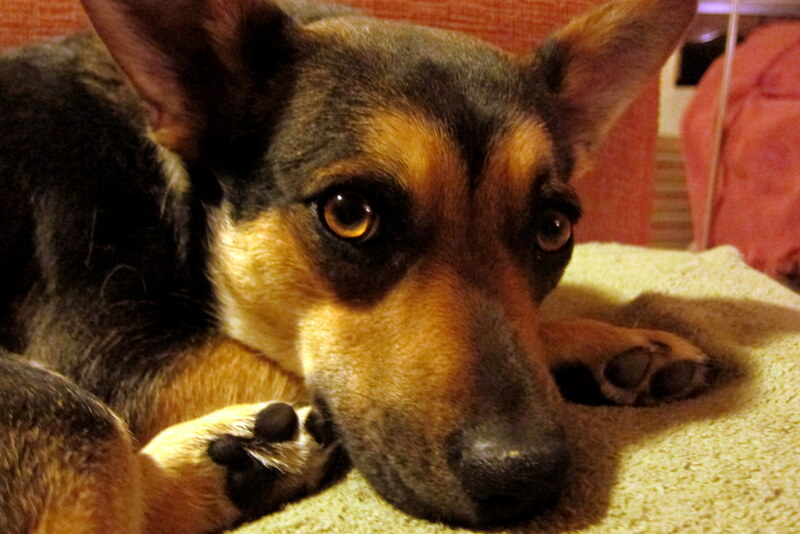 Wiley shared with us stories of her field work. She described some of the minerals she has discovered and showed us others she had purchased at the show. 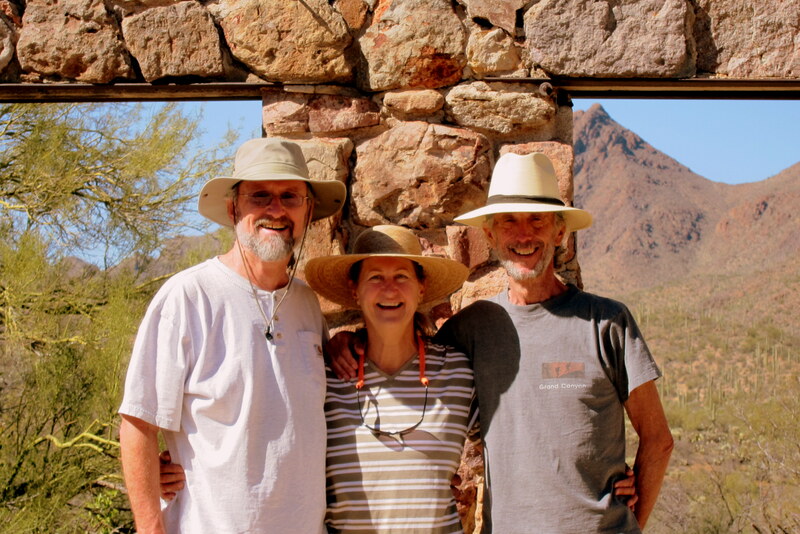 An interesting couple, we had a great time visiting with them before they headed out to spend a few weeks in Moab, Utah. 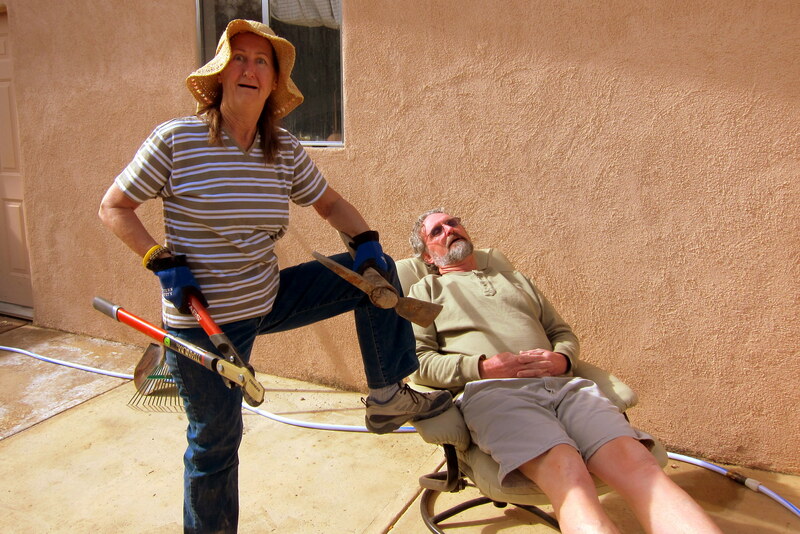 In order to earn our keep, Kit and I participated in a yard cleanup day…..an annual tradition at The Doobie Resort. A very nice tree in the back yard needs constant attending. This unusual Sonoran Desert specimen, known as a braciār abore, or “Fruit of the Loom” in English, possesses an unusual feature that attracts a lot of attention. After all the back breaking work, a few rounds of Medicinal Tequila were in order…..and a good night’s sleep was had by all. 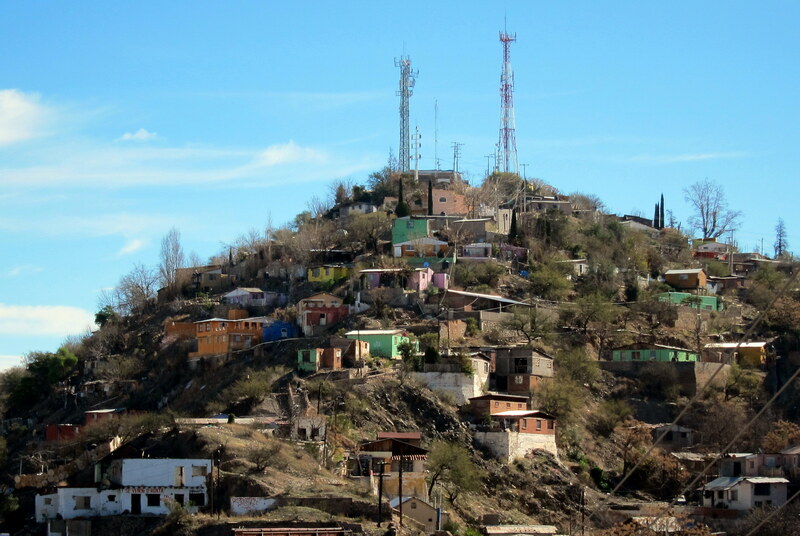 On another day we trekked south of the border to Nogales, Mexico. Dewey needed some dental attention and Bea was in the market for some cheap drugs…..um, make that medicines. 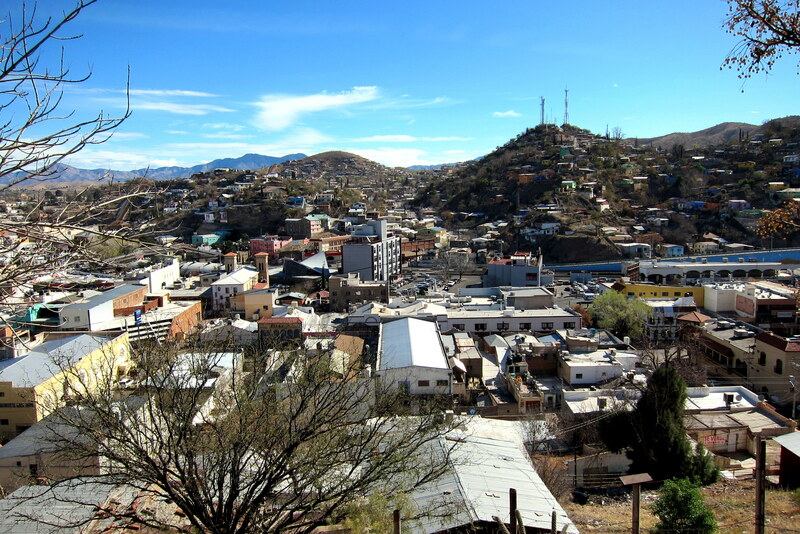 This city of over 200,000 folks lies in a narrow valley and up against the US border. 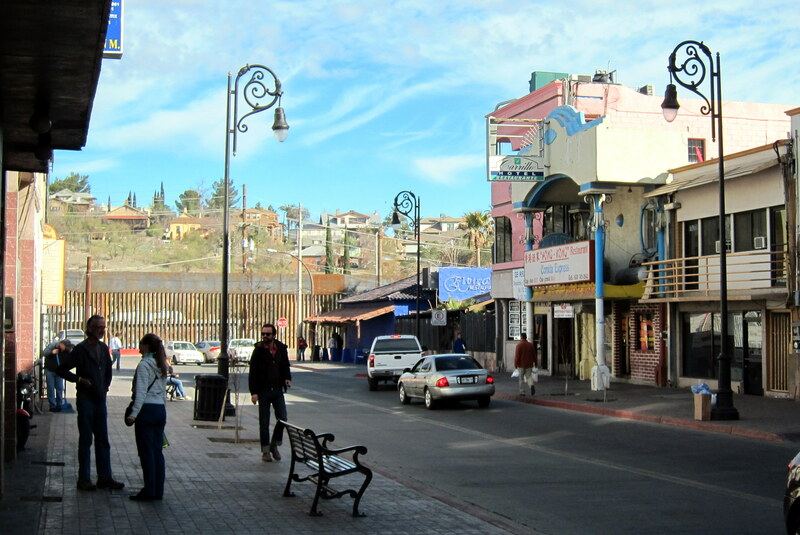 Notice the border control fence at the end of this Nogales street. 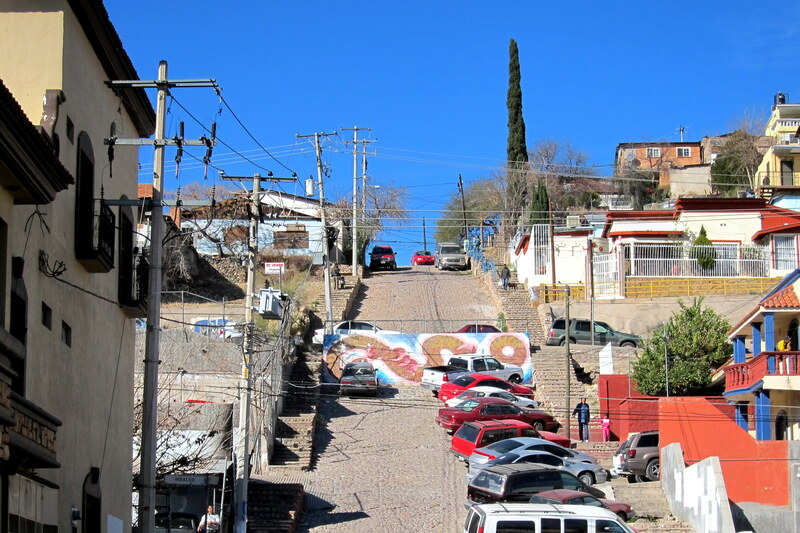 The downtown area is so tight that shops and homes are stacked high up both valley walls. And homes perch precariously to the hillsides. In the center of town lies an elementary school. 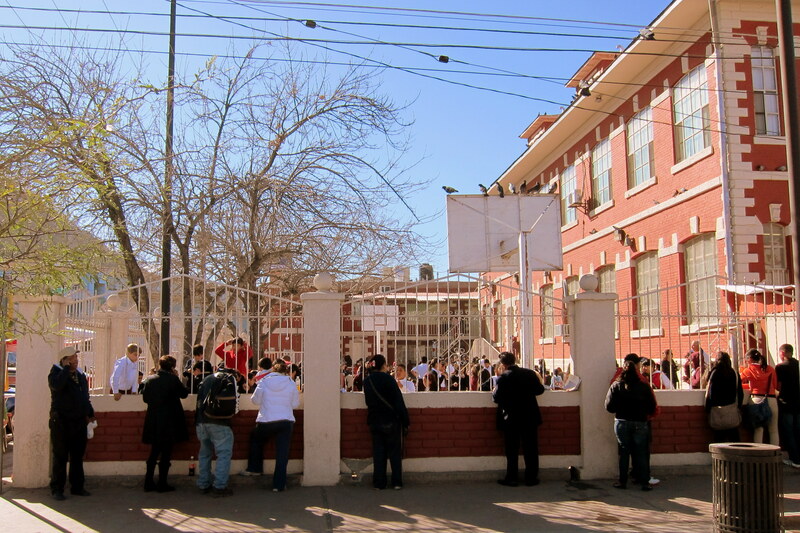 It was lunch time recess and parents had brought their children’s lunch to the schoolyard fence. Noticing a gringo snapping photos, some of the school kids ran toward the fence and pleaded for us to take their pictures. 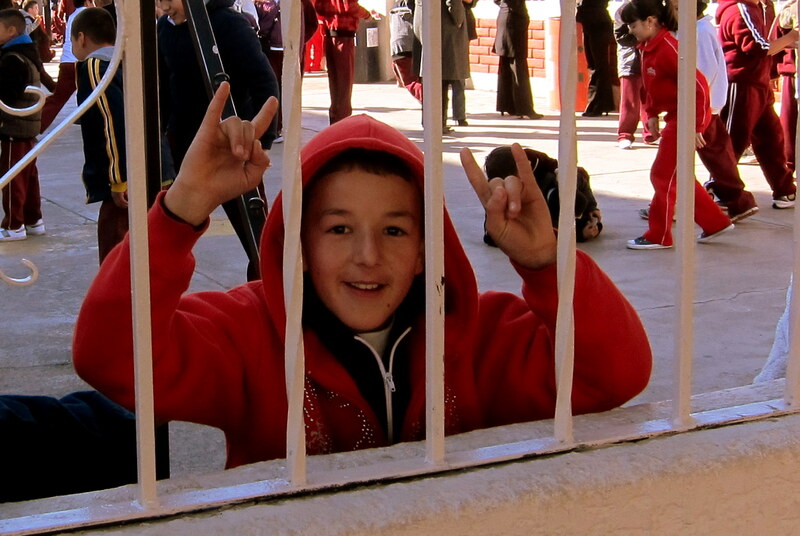 This young fellow was a real ham…..striking different poses as I snapped away. 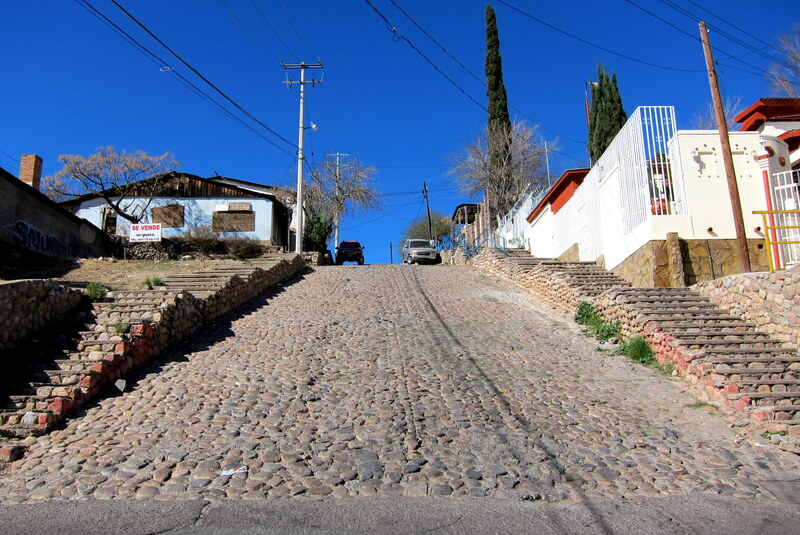 In order to get out of the tourist areas and get a better perspective on the size of the town we walked a side street up a very steep hill. Back in an old neighborhood the folks we encountered were very friendly even though we were obviously gringos. The sky was crystal clear and the view was incredible. 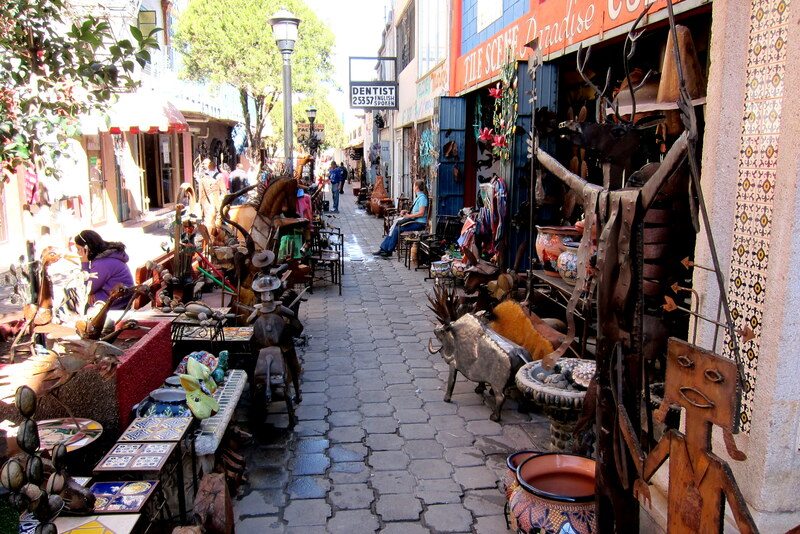 Back down in the center of town we discovered Dewey was still in the dental chair so we poked around the local bazaar. 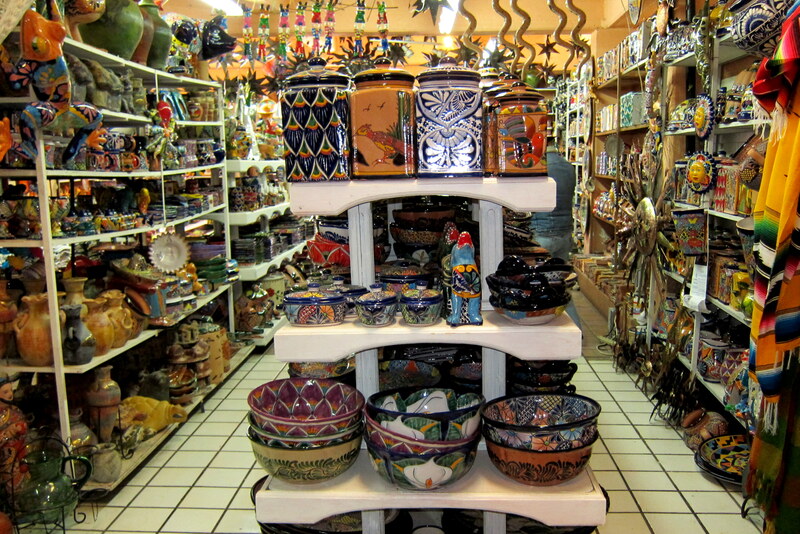 The stores were full of the typical Mexican goods and crafts one sees on the US side of the border but here there is a substantial savings. Most of the pottery pieces are made by folks in the small villages deep in the interior. The craftsmanship and colorful designs were amazing. Dewey was finally done and his bill was approximately 30% of what would be charged in the US for the same procedure. We learned that the dentist received his education in South America then interned in Texas before setting up his practice in Nogales. As Dewey, Bea and I walked back to the border we all agreed that, at least in this part of the country, all the bad press about Mexico was a bit overblown. At no time did any one of us feel threatened or in danger. Today’s experience was very similar to when, as a child, our family would make frequent trips into Tijuana to shop and dine. 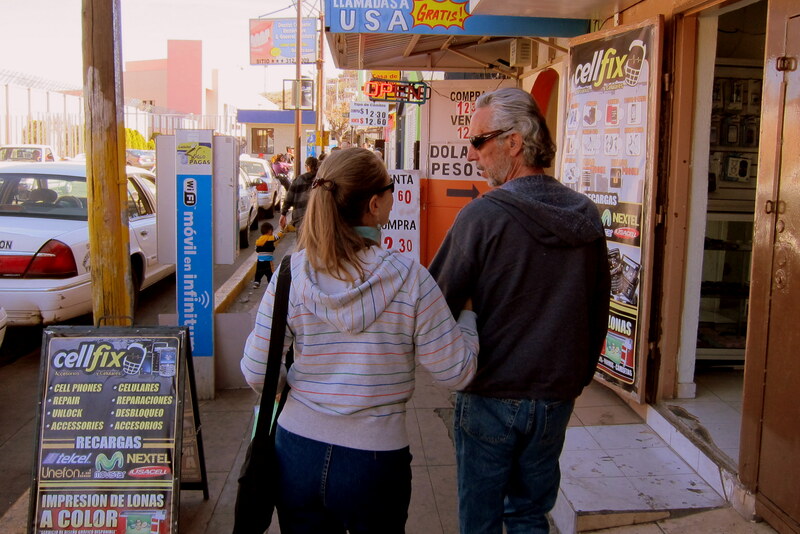 The signs, smells and feel of a typical Mexican border town came flooding back. 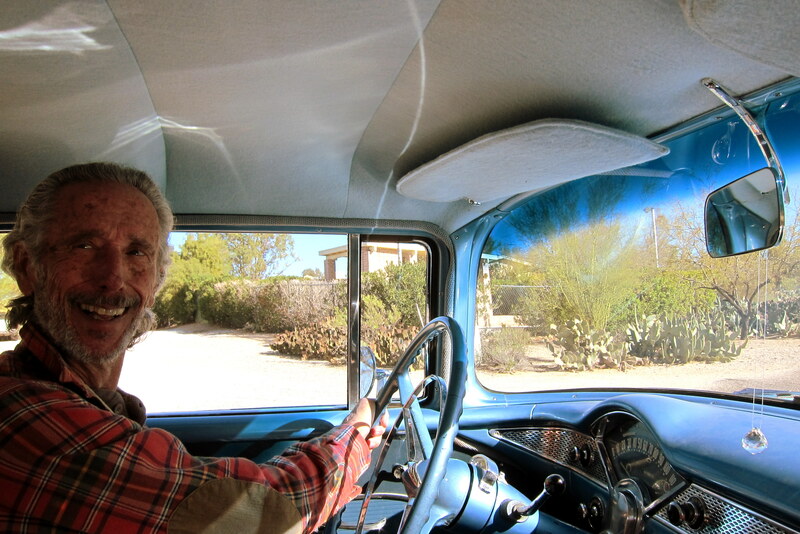 When Kit and I started planning these winter RV trips we intended to travel deep into Mexico, but then the drug cartels started shooting and we wisely decided not to. What a shame…..Mexico is a fascinating country! 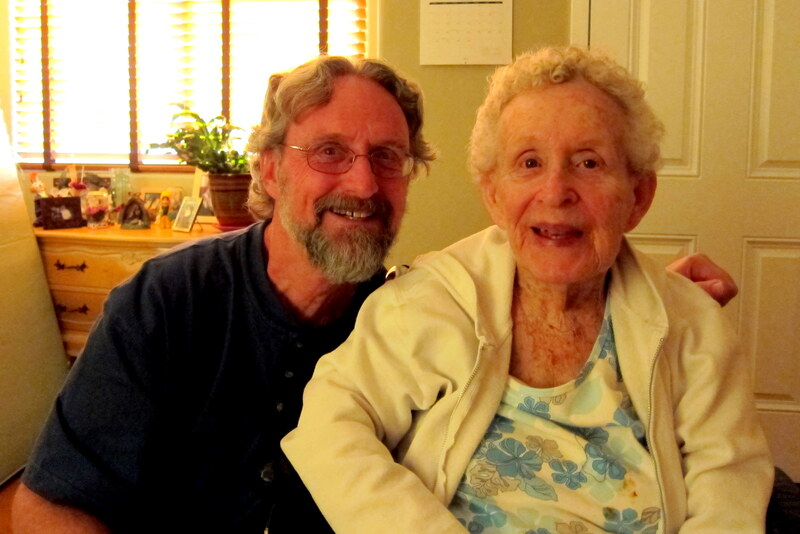 As I mentioned, mom is in a very nice assisted living facility in Tucson, very near where Dewey and Bea live. I made it a point to visit her daily at various times of the day in order to judge for myself how she is doing. 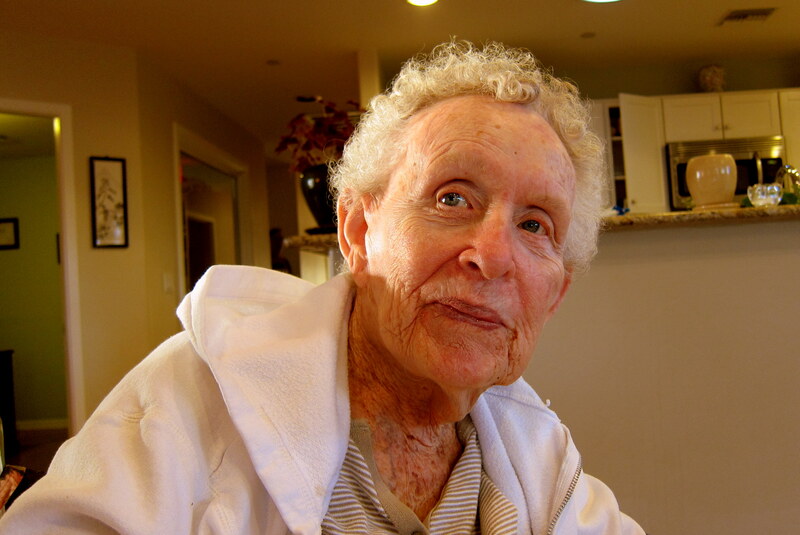 At 87 and battling a number of health issues…..she has a few good days but by and large, most days she isn’t well. 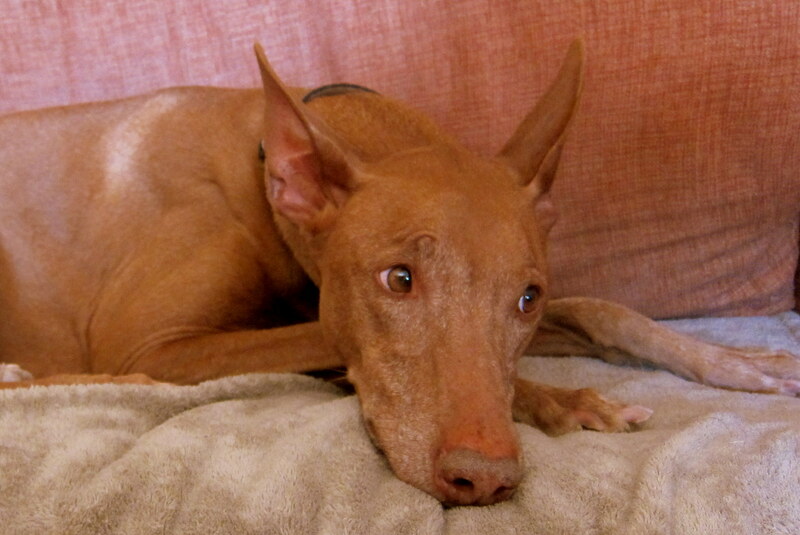 However her spirits are up and the care she is getting is superb. Mom is relatively pain free and is being kept as comfortable as possible. The staff at Crossroads frequently bring their children and grandchildren to work which the residents love. This little cutie was a featured visitor on a few occasions we were there. Oh…..and remember the mishap with the truck cap. Well it was bugging me to the point that I had to get it fixed…..and quick. Now normally I would bang, bend or otherwise “persuade” the thing back into some semblance of normal. However the concern over the inability to properly lock the door caused me to take the unusual step and get it fixed professionally. I was quoted a price of $450.00….Yikes! However, in shopping around I discovered a place that had a few used caps and parts…..so Dan and I took off to South Tucson to find Shells, ETC. My streak of “road magic” must be continuing as they had an exact match…..only problem was that the glass was broken. Not really an issue as the one man shop said that he could remove my damaged unit, swap my glass into the used door frame and reinstall the assembly….all for $125.00, and he could do the job while we waited! Looks as good as new! Dewey and Bea’s neighbor Manny has, over the years become a friend of ours as well. He is originally from Magdalena, Mexico and makes frequent trips home to bring clothing he purchases from the Goodwill to a local orphanage. On his return trips Manny imports the best Mexican food we have ever tasted. The tamales his sister makes are incredible and other family members specialize in making the best tortillas in the world. Manny also shares his bounty of fresh oranges and tangelos with us. Here are a couple of his beautiful oranges packing plenty of vitamin double C.
On the last Sunday we were in town Manny, returning from church, stopped by to bid us farewell. 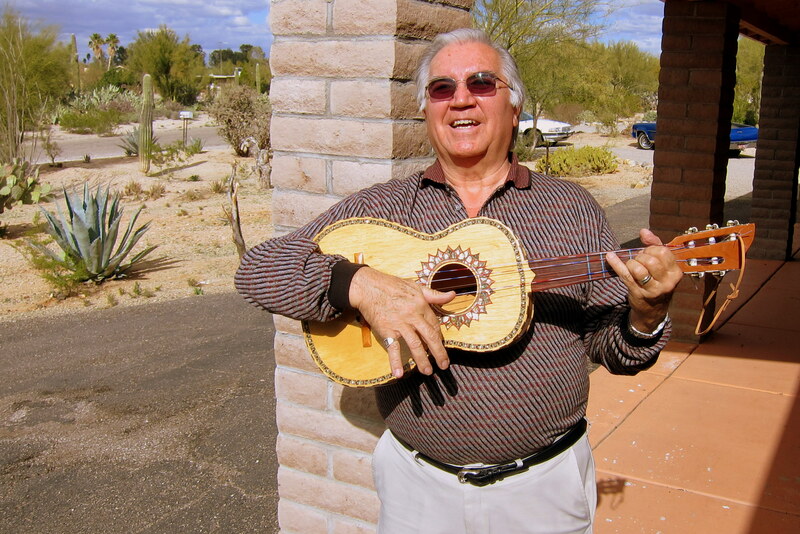 He happened to be carrying his Vihuela which he frequently plays, along with other mariachi musicians, during mass. 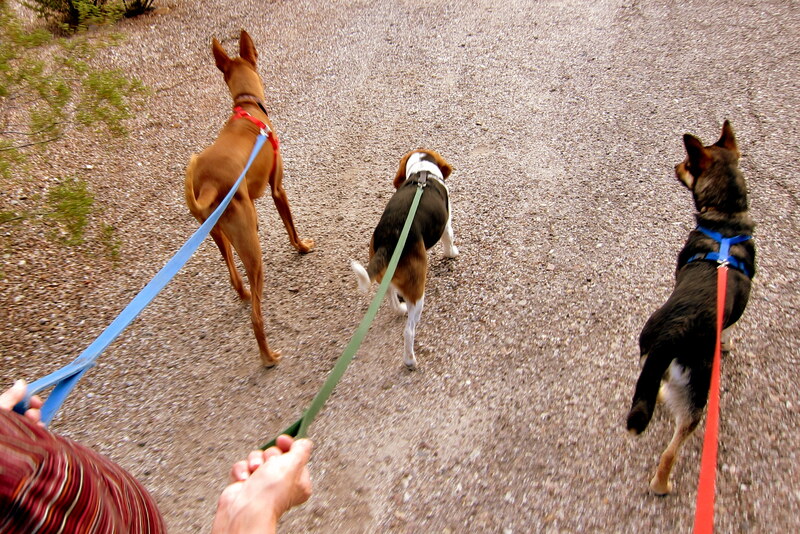 Having three active dogs in the house require frequent walkies about the neighborhood. I usually walked along and carried the ubiquitous “blue bags”…..a chore I trained for most of my working career. Since we were in Tucson for Super Bowl Sunday, and since the Patriots were playing, we made a party of the occasion. The fare was an interesting mix of Mexican, New York and New England regional foods along with the associated drinks…..a good time was had by all and the game was thrilling to watch. Kit wanted a Kit day to shop, oz around and relax so Dewey, Bea and I took the opportunity to do some hiking in the Tucson Mountains, southwest of town. We hiked the Yetman Trail, a 6 mile jaunt through beautiful desert landscape which leads to the abandoned ruin of the Bowmen Ranch. 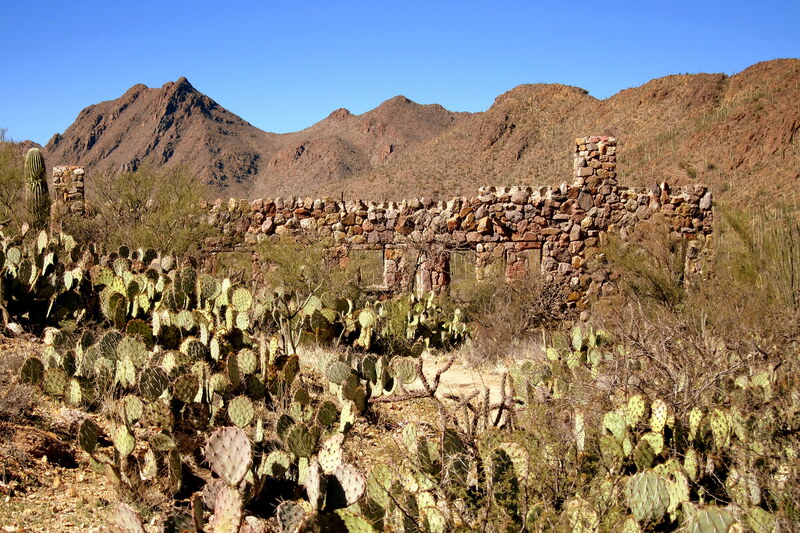 This pioneer home, nestled in the valley of towering mountains, was built in 1931 by a homesteader who claimed 2,000 acres many miles from the then small town of Tucson. The remoteness caused some marital strife and the place was abandoned shortly before WWII. It is made entirely of local stone and features a built in stone cook stove as well as a fireplace. The well and outhouse are nearby on opposite sides of the structure…..yea, that makes sense. 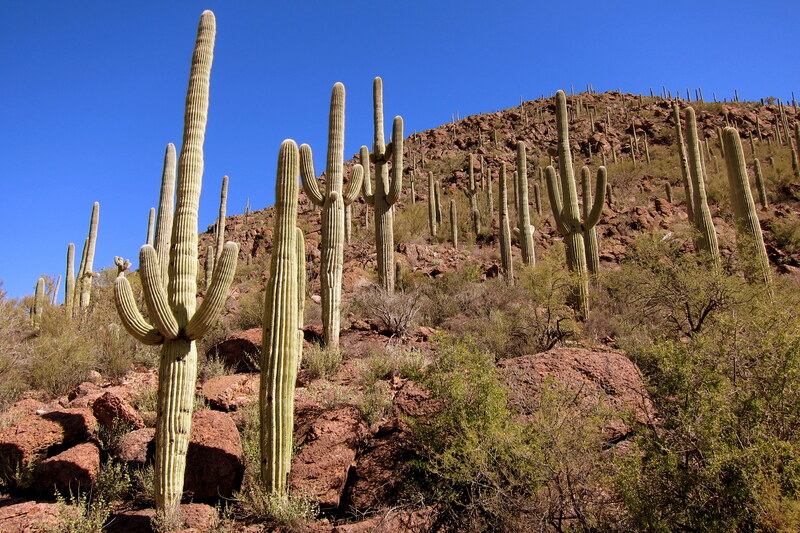 The Saguaro Cacti are as plentiful and magnificent as those in The Saguaro National Park a few miles to the east. When I was a kid growing up in San Diego, our family would make numerous trips to Arizona to visit Dewey (this was back when he was just my cousin and before he became my brother) and his family. A Tucker family tradition was to make my brother Don and I pose by a Saguaro Cactus and position our arms to replicate the cactus’s arms. This prickly situation (pun intended) was an embarrassment to us but we posed and smiled and hoped none of our friends would ever see the photos. Of course I had to continue this silly game with our kids and eventually our grandkids. 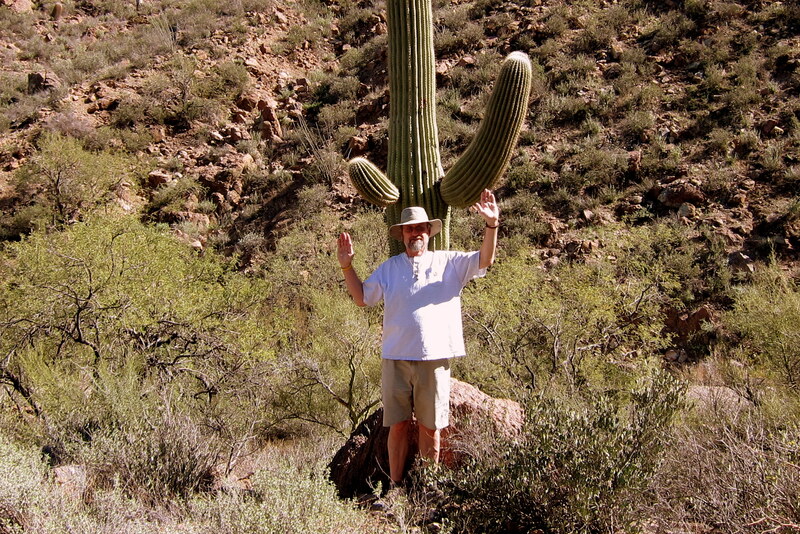 So, fair is fair…..it’s my turn to be like a cacti. Hot, dusty and thirsty after our hike we made our way to the older portion of Tucson and the Barrio Brewery. Their onsite brewed beers and ale combined with their southwest tavern fare have a strong local following. Even Willy Nelson’s grandfather frequents the place as seen here quaffing a beer with a young chick. The Barrio Brewery lies in an industrial area and is hard up against active railroad tracks. The established policy is that whenever a train pulls in and blocks the parking lot, then the drinks are on the house. Reportedly this happens every few days and some folks time their visit to the train schedule. While we were off hiking and recovering at Barrio Brewery, Kit met the daughter of some good friends from back home. 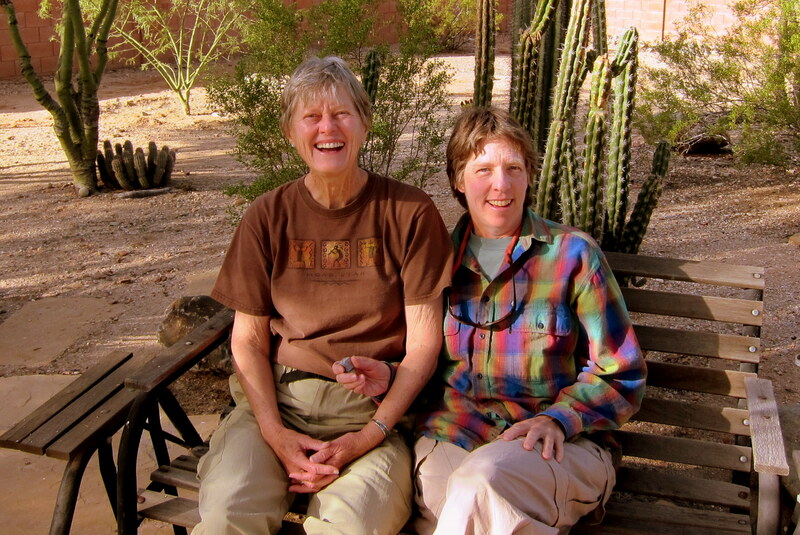 Sandy is living in Tucson with her partner Marie, who is a minister at a local church. 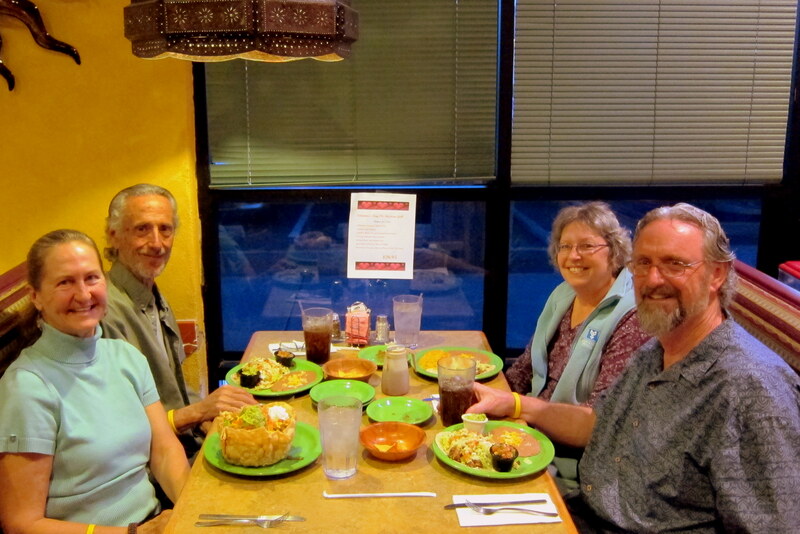 They all enjoyed some great food at the Native New Yorker restaurant in Marana and got caught up on the latest news. The sunsets from Dewey and Bea’s rooftop deck are spectacular. 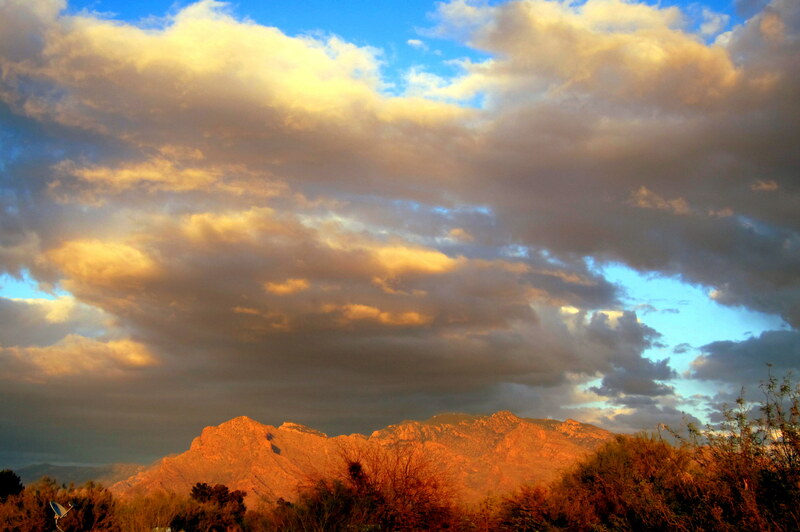 Most folks watch the setting sun to the west…..but in my opinion the best view is to the east as the sun highlights the peaks of the Santa Catalina Mountains. 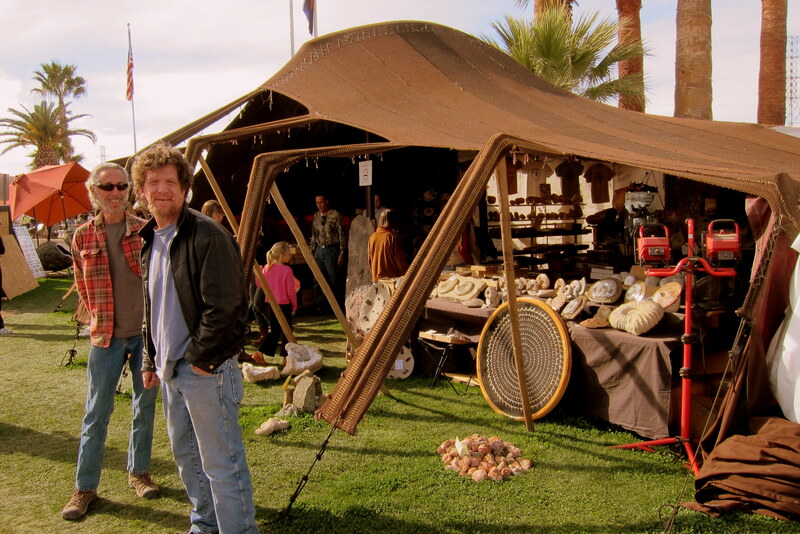 Dewey is an accomplished craftsperson and has recently learned how to make Survival Bracelets out of Parachute Cord, or otherwise known as “Paracord 550”. This lightweight nylon rope was developed during WWII for use as suspension lines on military parachutes. Once on the ground the components of the chute were used for various purposes and the Paracord 550 (designated 550 because the rope has a tensile strength of 550 pounds) was useful in many different applications. After the war, when many military surplus items were available to the public, Paracord was discovered by hunters, hikers and other outdoor enthusiasts as an inexpensive and versatile rope. Later, it was discovered that the paracord could be braided into lanyards, belts and straps to wear. Then if the cord was needed in an emergency situation it could be easily pulled apart and pressed into service. 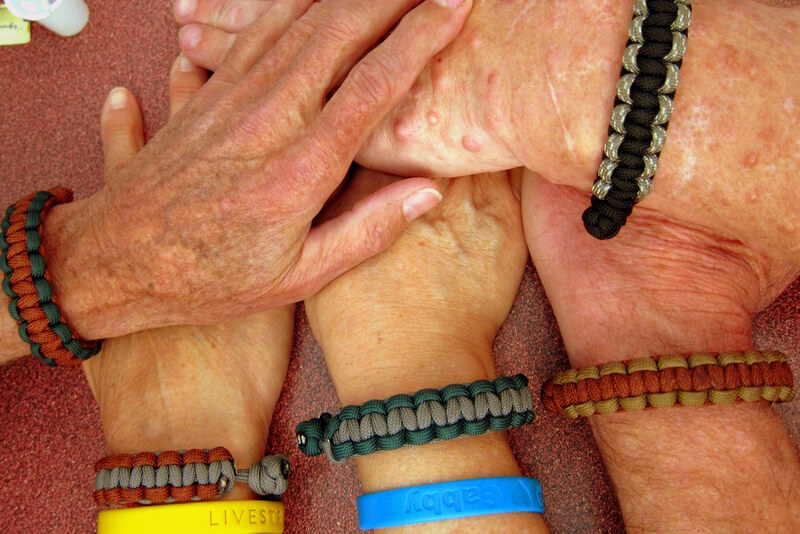 The Survival Bracelets that Dewey specializes in contain 10 yards of paracord and are very decorative. He made a bracelet for each of us and was patient enough to show me how they were constructed. 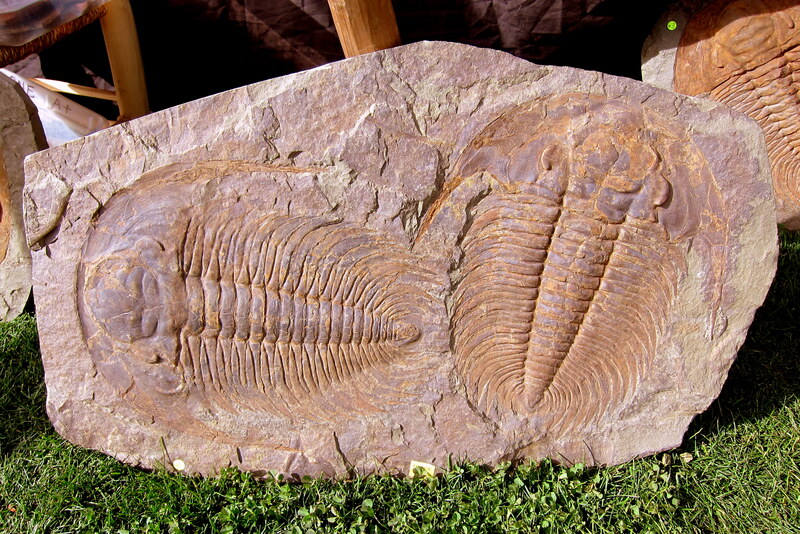 Dewey also provided me material so I could practice and make a few of these interesting items myself. Below is a photo of his handiwork. 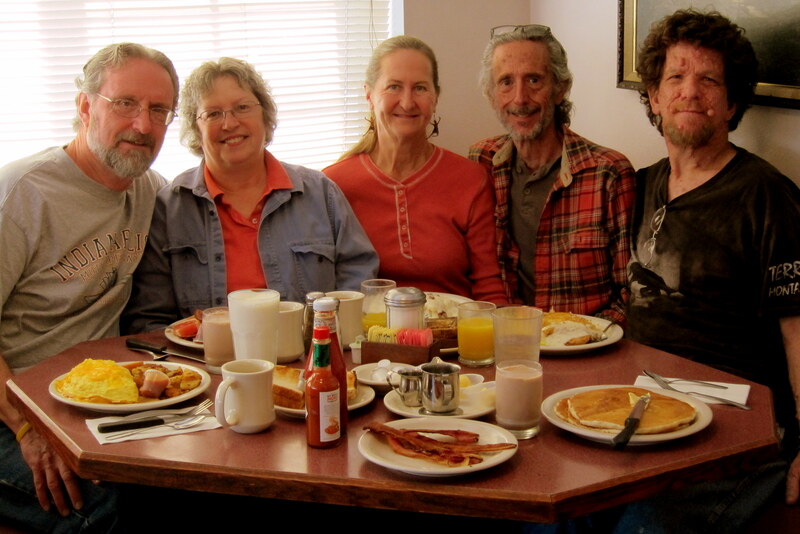 The morning we left Tucson we all met at a local restaurant, The Old Time Café, and enjoyed a great meal and conversation. I devoured a Mexican Omelet complete with Chorizo and Chili Peppers…..it was outstanding! 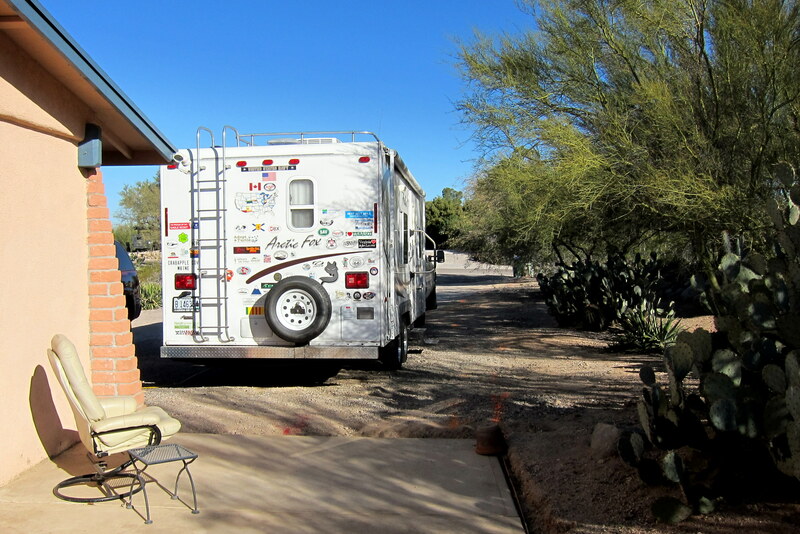 Reluctantly we leave family and friends in Tucson as we head north on further adventures…..stay tuned. 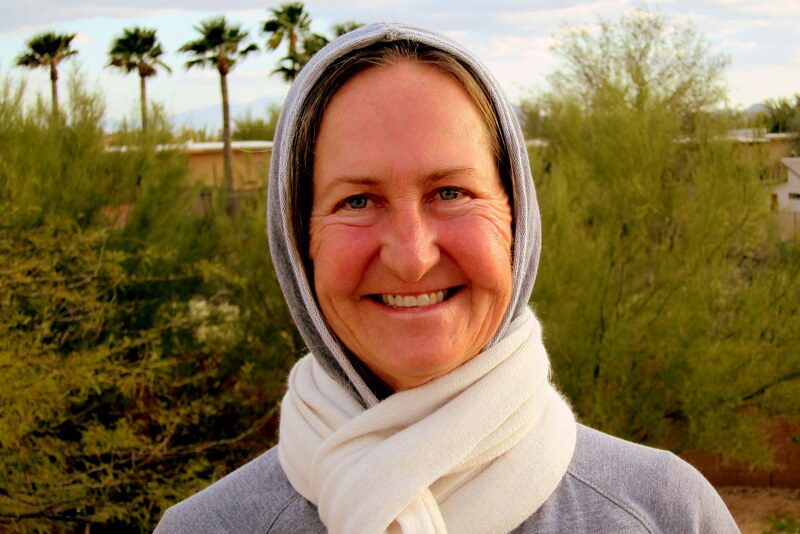 Kit’s Corner: We had quite a nice time in Tucson this year. It’s always good to see family and catch up on the latest news. Best of all, of course, was seeing Nana! She’s always very pleased to see us and still laughs at Bill’s corny jokes! She is also still sharp enough to have a quick comeback to his goofy remarks that often, only SHE understands. We are very grateful to the staff at Crossroads for their wonderful care and especially grateful for Dewey, Bea and Dan’s efforts on Nana’s behalf. They are our eyes and ears and we appreciate everything they do to care for Miriam. As always guys – enjoyable. A very nice read. By the way – is the paragraph starting with “First the food…..of course.” – just after you guys and the dogs on the couch – supposed to be duplicated? Maybe just to see if anyone catches it. I would expect nothing less of Bill. Uhhhhh, yep…..I um, intended to make that mistake, yea, and um, you caught it…..good job. Now I probably should make it read correctly unless folks think I’m an idiot, you know, um…..just in case and everything. Looking forward to seeing you folks upta Maine come spring! Stay safe!! Nile and Max don’t look like twins to me!!!! Have you been hitting the Tequila a bit too much Mr. Bill??? That’s cuz de is Fraternal Twins! Hey, tell Uncle Dewey that I want a paracord bracelet! Thanks…..our love to you guys as well……stay safe and happy! LOVE THE GREAT LOCAL MEALS YOU TAKE PHOTOS OF, ESPECIALLY THE CARNE ASADA PACKED BURITTO. I’LL BE SENDING A PICTURE OF A FOOT LONG KOSHER HOT DOG JEANNE JUST SERVED FOR LUNCH. NICE TO HEAR YOUR MOM IS GETTING ALONG WELL, WE ARE HEADING DOWN TO ATTEND A 94TH BIRTHDAY PARTY FOR JEANNE’S MOM THE MIDDLE OF THIS MONTH. SHE’S IN AN ASSISTED LIVING FACILITY IN NORWOOD MASS CALLED SUNRISE. WENT OUT FOR DINNER AT THE TEXAS ROAD HOUSE IN SCARBOROUGH WITH NAN AND WINDYFOR MY B DAY , WE ALL HAD PRIME RIB, V GOOD. SNOWED ABOUT 8 INCHES ON WEDNESDAY/THURSDAY AND WE’RE HAVING HEAVY RAIN TODAY. THE BAY IS STILL ICED IN BUT GETTING PRETTY PUNKY. SAD ABOUT THE TORNADOS, WE HAVE FRIENDS IN KENTUCKY THAT HAD A CLOSE CALL. THEY MAY EVEN REACH WHERE TONY AND DIANE ARE IN GEORGIA. We will, you all stay safe as well. Sounds like you guys are as busy as ever…..hope you had a great birthday! We are so lucky to get your ongoing travelog. The writing together with the photos brings your destinations into our lives. BTW, thanks for the AARP article. Reminds me of what’s important. Thanks for the nice comment, looking forward to seeing you in a square real soon! What is “moderation? I am essentially immoderate. Well……what a coincident…..I am essentially immodest! Good stuff — I always reading about the latest extension of your travels. Have you thought about going to work for the Travel Channel. Thanks…..I was following you OK until you used that four letter word! I cannot believe that the 55 Chevy has not been featured as the top billing in previous posts. What a ride! 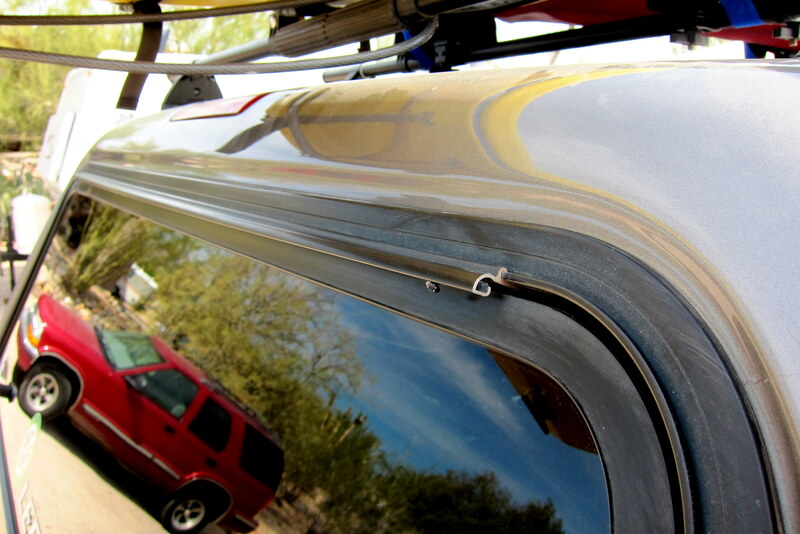 Put a hitch on it and ditch the pickemup. I mentioned it briefly last year when she was still undergoing modification. 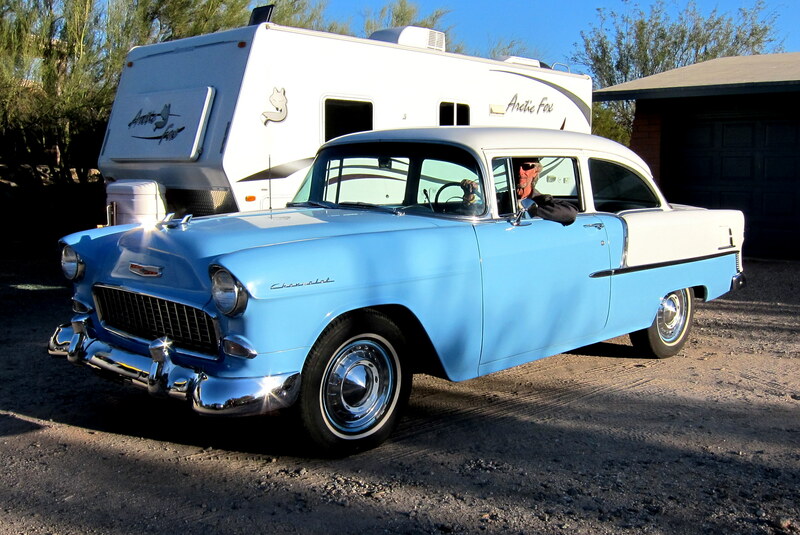 She is a beautiful ride…..needs a 55 teardrop trailer to complete the effect. Bill and Kit, you guys have out done yourselfs again. Not only a great visit, but a great right up about it and our misunderstood part of the country. Though you might tone it down little, next time. With our water supply issues, we can’t take any more Snowbirds. One correction, how about just two and a half yards of paracord vs. 10 yards in a Doobie Survival barcelet. And yes, Kimber will have a bracelet shortly and I’ll have to second that teardrop trailer for my 55 Chevy. Thanks for the nice comment…..we had a blast, as always, at The Doobie RV Resort and Margaritum! Oh, and that should have read 10 feet of paracord. Of course it might be 10 yards for a Survival Belt…..just saying. Thanks for hooking Kim up with a bracelet…..I’m sure she will really like it! Love you guys……looking forward to seeing you this summer in Maine! Thanks for sharing. Your mom looks like a rockin’ lady. 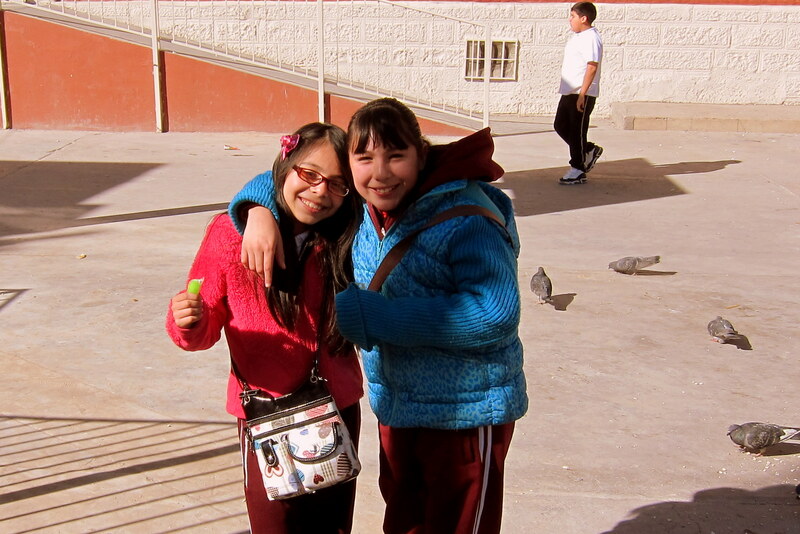 And your photos of Nogales brought back memories of a visit there four years ago. 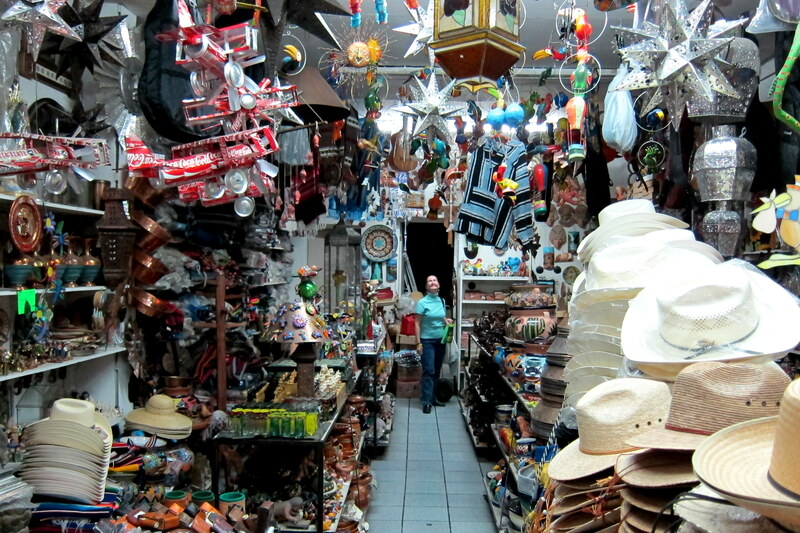 The shops were overflowing with colorful crafts, most of which would not fit in a carry-on bag for the flight back to Maine, so I only bought a handful of small trinkets as gifts. Most memorable was the border wall. It is a sad symbol that divides a land that was once, and deserves to again be, one. By the way, can you bring seeds for some of those Fruit of the Loom trees back to Brunswick. Or is that an invasive species? Glad to hear you had a great visit with family and friends in AZ. 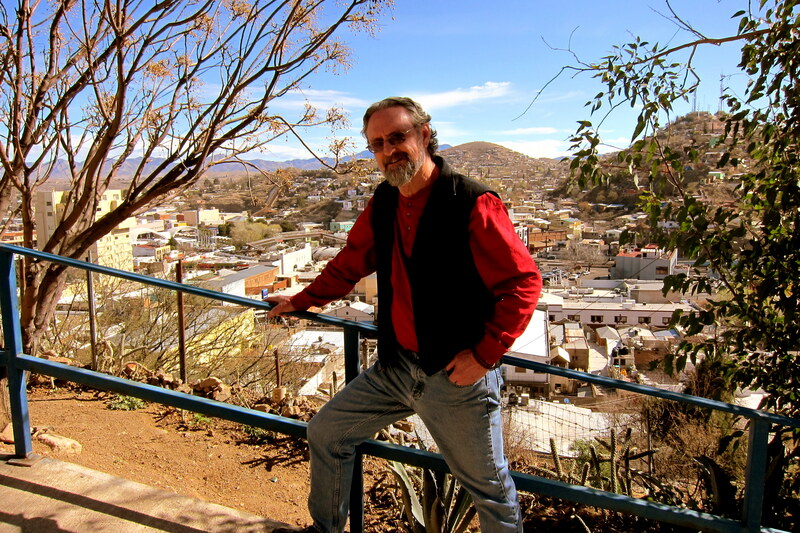 Thanks for the comment and the sharing of your experience in Nogales. My mom was the ultimate party girl…..seeing her incapacitated is hard, however she had an interesting and fun filled life. Love all of it!!! And your Mom looks great Bill. 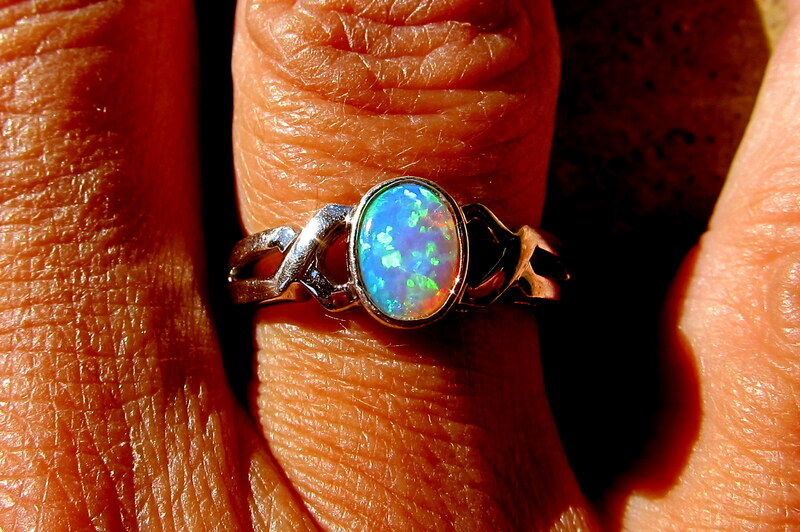 And the PBR…looks to me like a fire opal. Would love to visit that part of the world. Glad I can do it through you. Thanks for the nice comments. 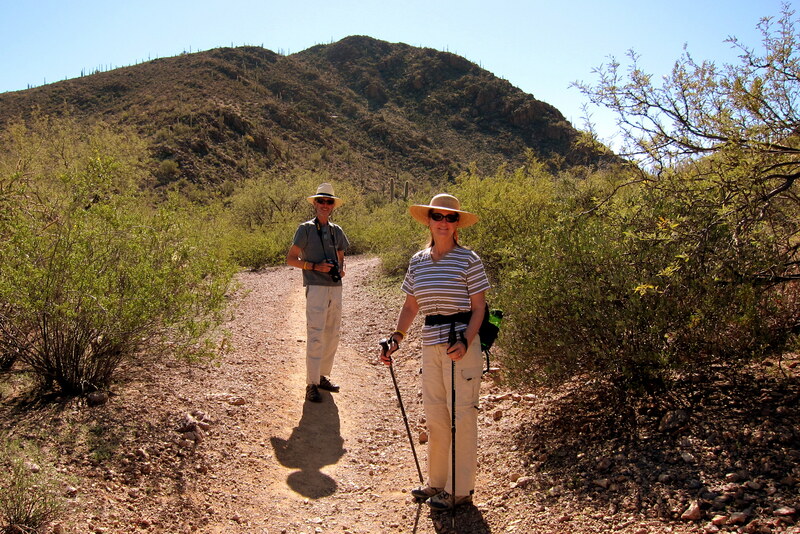 We love traveling about in the southwest. You should visit….this area is a bit misunderstood by most Yankee folks. OBTW, I am brushing and flossing daily!